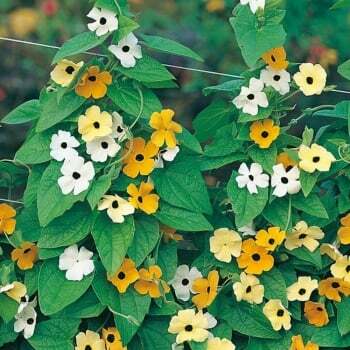 These Mr. Fothergill's Black Eyed Susan Susie Mixed seeds from Ruddick Garden Gifts make a delightful trailing plant with their white, yellow and orrange blooms many with black eyes. Perfect for trellis, baskets and conservatories. This half hardy perennial will grow to 48" in height and you get an average of 20 seeds per pack.